When applying for SAISD’s choice programs, parents may choose three programs per child. While we started out with the ambitious goal of visiting about five schools before applying, by the time we visited our top three choices, we were pretty much set. Both kids are in the lottery for Steele Montessori. Moira went on the Kinder waitlist at the Advanced Learning Academy, and both kids are in the lottery for Mark Twain Dual Language Academy. While Moira is an obvious candidate for dual language—she watched Frozen in Spanish the other day, and still quotes the few phrases she could understand—we don’t know yet how well Asa take to it. Moira was bilingual in French and English until she was two and a half, thanks to her caregiver (not her monolingual parents). She later picked up Portuguese from our Brazilian au pair, Jessica. Asa, who was home with Jessica all day, did not pick up as much. Moira loves all things verbal, including, I suppose, the Romance languages. Of course, interest aside, there are tons of reasons to seek out bilingualism for children, especially in San Antonio, where speaking Spanish is a huge advantage socially and professionally. Learning two languages is good for children’s brains as well, as evidenced by Moira’s early exposure and continuing ease picking up vocabulary. At the Twain prospective parent night, the principal recalled funny examples of how students who learn Spanish from an adult speak Spanish with adult formality, whereas students who speak to other students in Spanish sound much more natural. Of course, “sounding natural” is a happy outcome for families whose main goal is bilingual biculturalism. However, the academic value of their language skills will be determined by a standard assessment. How we assess students ultimately determines the value placed on each skill, and English is still the lingua academia of the American public school system. To be considered bilingual, an English speaking child has to know less Spanish than a Spanish speaking child has to know English. The stakes are higher for Spanish speakers picking up English. Dual language, SAISD says, is the most effective way to achieve those ends for Spanish speakers, while allowing them to maintain and build on their native language—which is not a goal in traditional ESL. Dual language programs are supposed to be made up of a 50/50 mix of English and Spanish speakers. The children learn from each other, socialize in both languages, and learn their other subjects in both languages. Twain is in high demand, as are all programs that promise bilingualism and biliteracy. Spanish in particular is super “hot right now.” In many places the demand for Spanish immersion programs comes a predictable pushing out of lower income students, some of whom are the very ones who would benefit most from learning in their native language, and celebrating a language they hear spoken by family members. 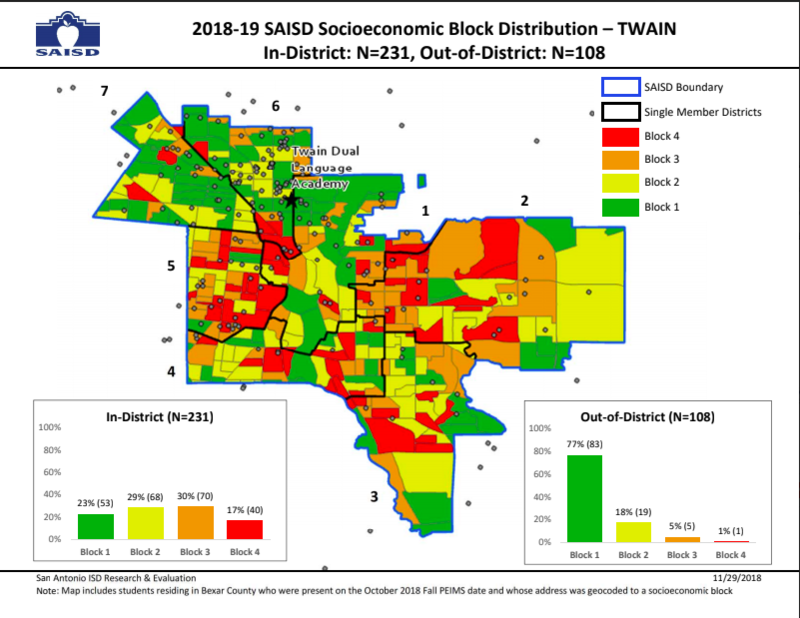 SAISD’s rapid expansion of dual language programs—this year 45 campuses, nearly half of all SAISD schools, offer dual language services— and the Diverse by Design socioeconomic protections at Twain make it unlikely that middle class families will take up a majority of the district’s dual language seats in the immediate future. For us, the main appeal of Twain is its location, which brings up a far more interesting point. We live less than one mile from Twain, which puts it at the top of Lewis’s list. We could, in theory, walk our kids to school. Forgotten lunchboxes…emergency vomit calls…all significantly more convenient to remedy. Twain is snuggled between Monte Vista, where the median home value is $499,000, and quickly re-gentrifying Alta Vista where median sale prices have gone up 33 percent in the past year. If this whole choice process were only about curriculum, Irving Dual Language Academy should be in similar demand. Both are Diverse by Design schools. Both wall-to-wall dual language. Both are building the student body from the ground up with families who have specifically chosen that school. However, Irving does not have the same student profile that Twain does. It’s student body skews poorer than the target 50/50, while Twain’s skews a bit wealthier. Twain has a waitlist a mile long—we’ve been told multiple times that despite living less than a mile away and applying with a three year old, that we have little chance of getting in. Our chances at Irving, given our socioeconomic status, would be better. Irving is located in the heart of the West Side. The homes in Irving’s zip code, 78207, have a median value around $78,000. It is, in a way, a test case for the district to see if appealing instructional models can overcome class anxiety. I recently drove the route between Twain and Irving, watching the neighborhood change around me. Sidewalks became spottier. Tree canopies thinned. All the signals of middle class economics changed to working class as I turned south on Zarzamora and west on Culebra. Thanks to years of reporting, I’m familiar and comfortable on the West Side, but I tried to take myself back to the first time I parked my car at the Lincoln Heights apartments. Would I have, in that frame of mind, been willing to leave my child in a place that I had been so conditioned to fear? It looks like SAISD administrations-past never anticipated such a question. I didn’t apply to Irving, and I don’t think it would have been somehow more virtuous for me to do so. I also do believe that many wealthier parents will embrace the school, as long as it serves students well. I just can’t help but notice the many ways in which our segregated city has left its imprints on our psyches–what we fear, what we want, and where we feel at home.